The whole Arizona State is subject to movement of migrants as it is one of the few states sharing a border with Mexico. As per convention, the U.S. Immigration and Customs Enforcement officials drop off the migrants, whose cases are pending in courts, in Greyhound bus depots. But, now Greyhound decided not to allow any migrants into the bus stations without a ticket. Those who have been dropped off by the federal officers are waiting outside. The U.S. Immigration and Customs Enforcement also have confirmed that it had been asked to drop the migrants off outside the stations. It should be noted that the migrants used to be dropped off there before any decision could be made whether they would stay in the United States of America or not. However, Greyhound spokeswoman Crystal Booker said that the company had decided due to an “unprecedented increase of individuals” at some bus terminals. Hence, it was made mandatory that one needs a ticket to get into the station. She added that the rule doesn’t apply to any specific person; it applies to anyone without a ticket. It should be noted that the migrants dropped off by the ICE usually do not have any prior notice, and as a migrant, they also do not have much money to sustain themselves or make any arrangements for travel. They usually wait there for any friends or relatives to come and help them until their cases at the court are solved. The United States has seen a considerable number of migrants traveling with their families from Central America. The prime causes of the migration are violence and escape from extreme poverty. As per ICE, it had released about 14,500 people who entered into the United States in Arizona only between Dec. 21, 2018, and March 5. Outside the bus station, there have scenarios no American wants to see. Around 15 adults and five children waited in a shaded area at the parking lot. Some had been there for the past 7 hours. The ICE depends on many religious and faith-based organizations to make arrangements for the migrants until they are moved into the homes of their friends and relatives. These organizations also help them with meals and other essential items. Connie Phillips, president, and CEO of Lutheran Social Services of the Southwest said the Greyhound is not at fault here as it is a company and it has other service obligations at hand. But the fault here lies with the officials as they do not have a consistent and long-term way to deal with this matter. 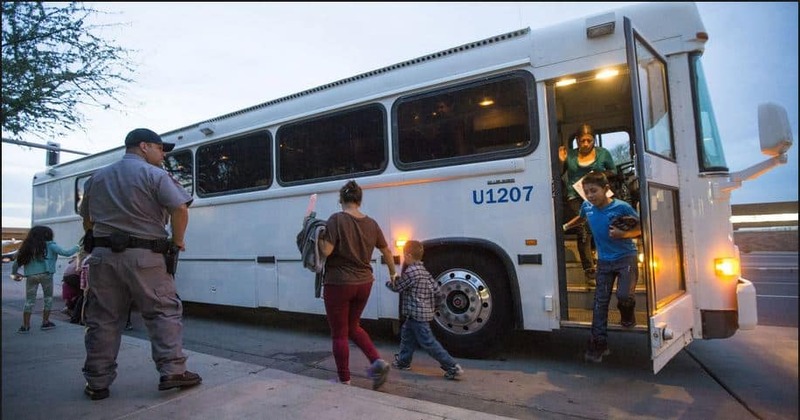 As per ICE, they only drop migrants off at the bus terminals when they do not get any response from the non-profit organizations, or the shelters are full in capacity. ICE spokeswoman Yasmeen Pitts O’Keefe said that ICE wanted to mitigate the pressure on resources in the local community as they have been experiencing an influx of a higher number of migrants families crossing the border.